Colicchio & Sons's beautiful decor and high ceilings create an awe-inspiring first impression. "Awe-inspiring" can also be "accessible," however, provided that you know some basic information about the restaurant before you dine there. It's good to know, for instance, that the food itself is artfully created and that the servers -- especially Eric -- will walk you through anything and everything in the greatest detail. If you'd like to learn even more about the dining experience, please read on so that you can maximize your enjoyment of your special time at Colicchio & Sons. Reservations are strongly recommended and can be made by calling the restaurant directly or on OpenTable.com. Seating at Colicchio & Sons is quite comfortable, whether you choose the armless wrought iron and woven leather chairs, the butterscotch leather banquettes or the curvilinear red chairs in the lounge area. 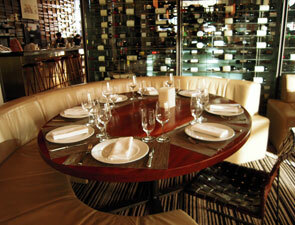 The main dining area chairs are about 19 inches in diameter at their widest point, so it gives you a bit of extra room. Tables are strategically placed throughout the restaurant with more than enough room to ensure you have your dining privacy. Tables themselves are about 52 inches in length for the larger, rectilinear tables and about 36 inches in width for the smaller ones. AtmosphereThe ambience at Colicchio & Sons is happening, as music plays throughout the bar and the restaurant area. Although you might not want that romantic dinner for two here, you'll definitely want to take your business colleague or a friend with whom you want to catch up, as Colicchio & Sons provides a fun spot with fantastic food for that festive social occasion. With all the modern touches, you'll almost forget that you're in the meatpacking district -- until you notice the touches from the building's original structure, such as the riveted columns that are located throughout the dining room. All in all, you'll be amazed by the decor and even more thrilled with the food. If you get a chance, ask for Eric G. as your server; he's wonderful! The restrooms at Colicchio & Sons are in the restaurant and on the same level as the dining room. Colicchio & Sons is easily accessible by taxi, subway or car. If you choose to drive, you can attempt to find parking on the street, or at one of the variety of parking garages nearby. Spots on the street are few and far between, however. Tom Colicchio and the restaurants he's been involved with have received many awards. Here's a sampling related to the Craft family. Las Vegas Life magazine's Epicurean Award for Best Steakhouse for Colicchio & Sons, Las Vegas, 2005; Las Vegas Life magazine's Epicurean Award for Best New Restaurant for Colicchio & Sons, Las Vegas, 2003; Bon Appetit and Food Network's American Food and Entertaining Awards: Chef of the Year, 2002; James Beard Foundation's Best New Restaurant Award for Craft, 2002; The New York Times 3-star restaurant review for Craft (William Grimes), 2001; Time Out New York's Eating and Drinking Awards: Best New Restaurant for Craft, Best Design for Craft, and Best Chef for both Craft and Gramercy Tavern, 2001; James Beard Foundation's Best Chef New York, 2000; Food and Wine magazine's Best New Chefs, 1991.